Though the buffing process sounds simple, success takes knowledge and practice. There are two specific issues you must be aware of. The first and most important involves safety. 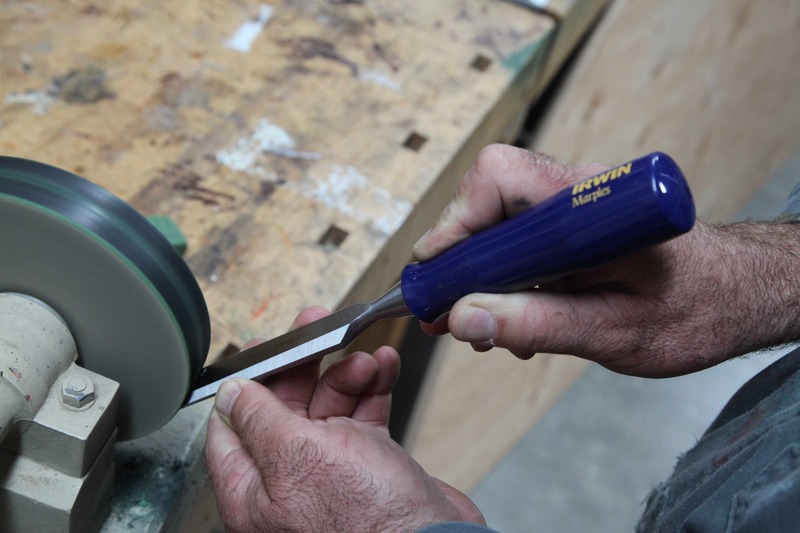 The tip of any tool must always point in the same direction as the buffing wheel rotation. Ignore this requirement and the tool will be caught and flung out of your hands dangerously. Some people build buffing wheels so they rotate away from themselves (opposite to the usual orientation for grinding), so they can use a tool rest while buffing. My own preference is to have my buffing wheel rotate towards me, as you’ve seen in the first video. This allows me to watch the angle of the tool edge more effectively from above as I’m buffing freehand. This is especially useful for honing curved carving chisels that can’t be buffed on any kind of tool rest because of their irregular shape, but it’s also an advantage in my book for sharpening straight tools. The second crucial buffing issue has to do with how well the tool will cut when you’re done honing. 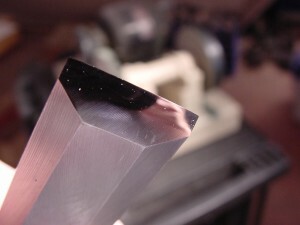 Since the abrasive action of this honing technique is so aggressive, it’s possible to remove visible amounts of metal from a tool tip in very little time. What you’re aiming for is holding the edge of the tool tangent to the edge of the buffing wheel. The video you’ll see below shows what it means to buff tangent to the wheel. Getting this right is crucial to proper sharpening results. The hard felt buffing wheel is the workhorse of my system, but you can’t use it everywhere. Check out the next lesson When Not to Use a Hard Felt Buffing Wheel to see what I mean.